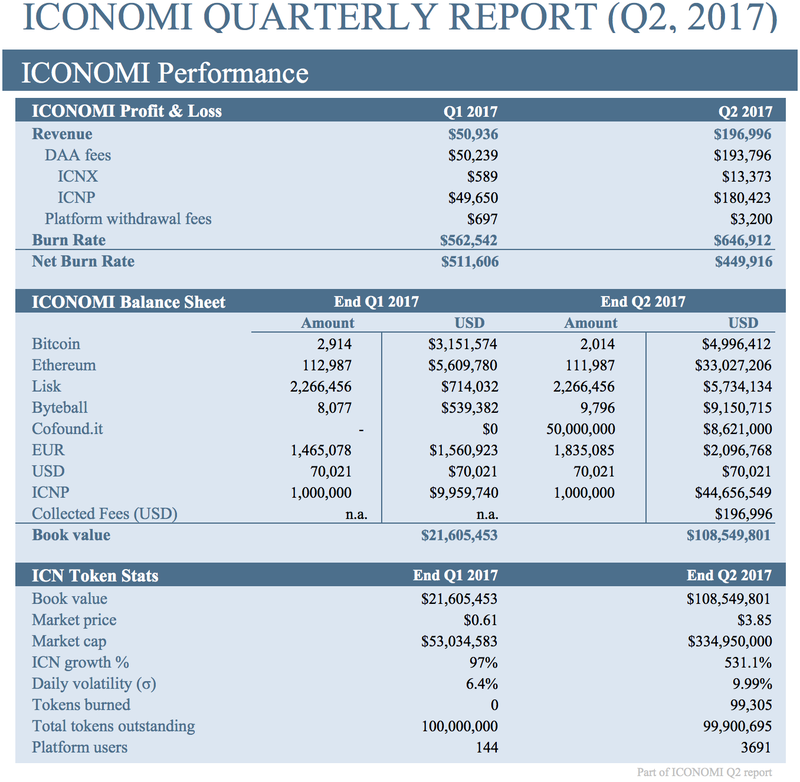 The book value of ICONOMI at the end of Q2 2017 reached $108,549,800.00 and represents an approximate increase of 402.4% in the quarter. The crypto market environment was overall very favourable in the second quarter. A large boost to ICONOMI’s assets also came from Cofound.it token sale, where ICONOMI received 10% of total CFI token supply, corresponding to $8,621,000 at the end of the second quarter. Note that revenues presented are in USD equivalent, whereas structure consists of tokens such as BTC, ETH, ICNX, ICN and CFI. ICNP sold 2398 units of GBYTE and received 3,059 ETH in Q2. Since GBYTE acquisition was free of charge, all sale proceeds represent realised profit and 20% of this profit is distributed to ICONOMI as a performance fee. ICNX, while still being in beta in Q2, collected $13,373 in fees, which includes a 3% annual management fee and an entry/exit fee of 0.1%. There are additional revenues of $3,200 in this period generated by platform withdrawals. Expenditures in Q2 2017 totalled $646,912. This includes salaries for 30 employees. In addition to this, we have 4 external associates and other partners. There are also legal costs, marketing costs, rent, equipment and travel expenses. In Q2 we concluded the repayment programme by buying and burning 99,305 ICN tokens using 1.000 ETH. The total amount of ICN tokens outstanding at the end of the quarter is thus 99,900,695. In Q3 we are continuing with our repayment programme using revenues generated in Q2 which amounted to $196,996 or 668 ETH. This amount equals 20% of realised profit made by ICNP in Q2 and fees generated by the platform. The token burn smart contract can be viewed here. WARNING: Do not send tokens to this address. Tokens sent to this address are permanently locked in the smart contract and cannot be recovered. As mentioned before, ICONOMI received 10% of the Cofound.it token sale (50,000,000 CFI) as part of the compensation for project’s concept having been developed at ICONOMI. 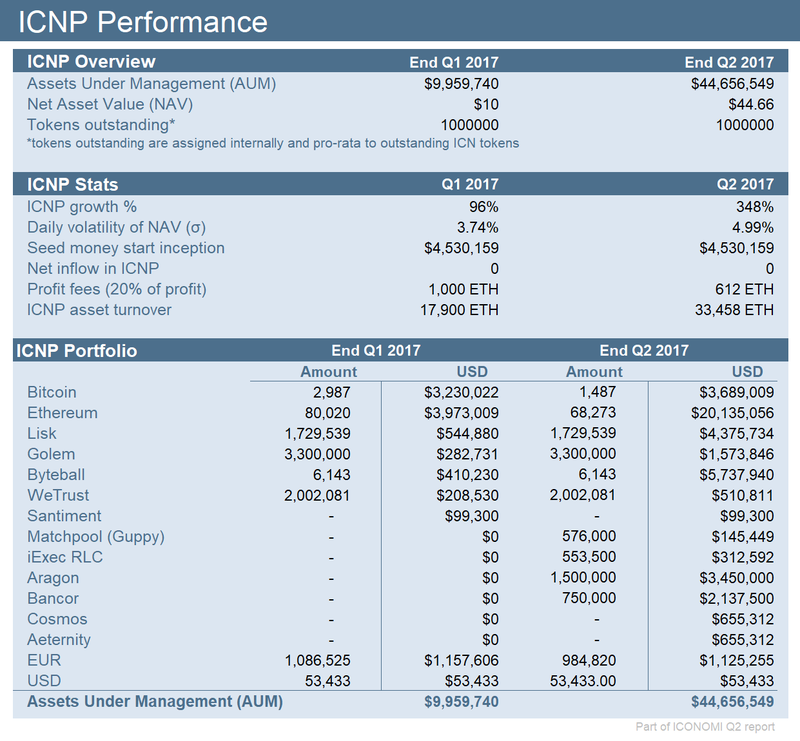 Since ICNP is a closed-end DAA, all the growth in AUM is the result of asset growth included in the ICNP. At the end of Q2 the AUM measured $44,656,549. This corresponds to an increase of 348% since the beginning of the quarter. A large part of this growth was realised by the appreciation of our uninvested assets such as Bitcoin and Ethereum. ICNP participated in seven token sales within Q2 and in total invested 28,144 ETH and 90 BTC. These include Bancor, Aragon, Aeternity, iExec RLC, Cosmos and Matchpool. We are monitoring new and old investments very carefully. We also closed approximately one third of our Byteball position, leading to a realised profit of 3,059 ETH. ICNX is a passively managed DAA with pre-defined rules published on the ICONOMI blog. Assets under management within ICNX at the end of Q2 2017 amounted to $2,973,118 and had 2,438,666.8 tokens outstanding, each worth $1.22 at the end of Q2. This is an increase of 287% since the beginning of the quarter. 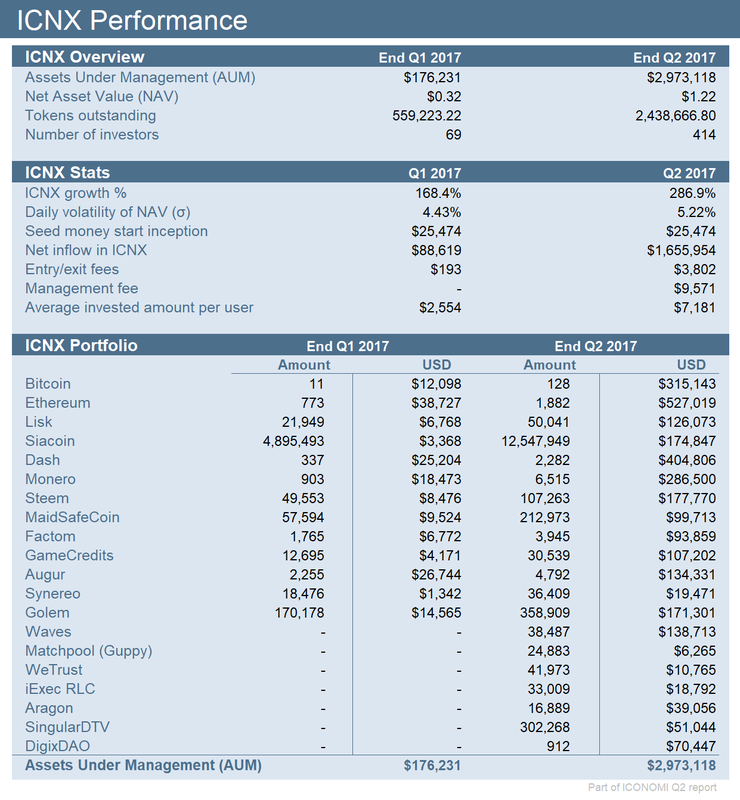 In Q2 2017, ICONOMI added additional 8 tokens to ICNX which now holds 21 different tokens. For live information about specific assets included in ICNX, please visit the ICONOMI dashboard on our webpage. At the end of quarter, ICNX tokens were held by 414 active investors, who on average have $7,181 of their assets invested. Total net money inflow measured $1,655,954 and was performed by 1546 buy and 424 sell orders. There are an additional $1,360,000 of assets which are held in BTC and ETH and are not invested by platform users.